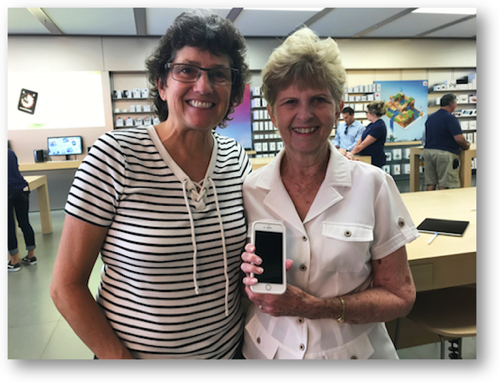 Steve’s mother, Merlee, is very clever and quick learning new things, so we thought it was time to try to convince her to move from a flip phone to an iPhone. I should mention that her flip phone lives in a drawer and never gets to come out to play unless she’s on a vacation. Steve’s father, Ken, also has a flip phone he brings out for vacations, but he tends to be more resistant to trying new things in the technology department. I have observed though that when Merlee moves out on new tech, sometimes Ken watches over her shoulder and eventually jumps in. Ken was convinced though that Merlee didn’t need an iPhone and that it would be excessively complex and she wouldn’t use it. He was also concerned about the cost. He pointed out that he only pays something like $40 a year for two phones, 20 minutes of calls and some limited number of text messages, so if it was more than that, it would be a big waste of money. One of our main motivations to getting Merlee onto a smart phone was because of how much she misses. When Merlee and Ken take the entire family on vacation, they often miss meeting spots and planning because they aren’t on the text message threads. Steve’s nephew did spend time with Merlee teaching her to text on her flip phone and she actually succeeded once or twice at reading and sending messages, but it was painful to watch how hard she was working at it. We were at the beach one day and I had to tease her because she kept playing with her phone instead of enjoying the surroundings! What that did tell us though was that she was motivated, and that meant we figured we had a high probability of success. Right around the time we were thinking of doing this, Kyle’s girlfriend Nikki gave me her old iPhone. It’s a 16 GB iPhone 6, and she didn’t care if we sold it or gave it away. I suggested to her that it go to Merlee and she was delighted. Nikki adores Merlee so this was a perfect fit. Another reason we thought she was ready is because she already uses and loves her iPad. She wasn’t convinced that the iPhone had any great value because she already has the iPad, but she was willing to give it a go. Merlee was even more excited when I told her we could add her to our family plan on AT&T for only $15/month. We share 18 GB amongst four of us and we rarely get close to using all of it, and I figured she probably wouldn’t be a big drain on our data usage. Now that we had her on board we had to plan a strategy. Merlee and Ken live about 2 hours away in San Diego, and one of the mistakes we’ve made in the past is to dump new technology on them on a short visit and then run back home. Either things stop working as expected, or they forget something we did – either way it wasn’t ideal. With something as complex as a new phone, it seemed that strategy would be unsuccessful in the end. Lindsay and Nolan (and Forbes) live in San Diego too, and we had a trip planned to go take care of Forbes while they went off on a mini-vacation, so we decided to combine the two plans. We’d go down to Forbes on Friday, and on Saturday make a day trip to introduce Merlee to the phone. We’d limit what we taught her to some basics. We’d scuttle off back to Lindsay’s house and leave Merlee alone with the phone for a day, but come back to Merlee’s on Monday after we were done taking care of Forbes and then stay the night. That would give Merlee a chance to play with it a bit, get some questions together, and then teach her a few more things if it was going well. With that part of the strategy complete, now we had to think about what we needed to teach her, what we wanted to teach her, and what parts of using a smart phone could or should be moved out to a future visit. Once we had a list together, we started to drag the subjects up and down into an order that made sense. We added additional subtasks to some of the items to flesh out the strategy. Setting up the order was an interesting thought process. We looked through our list and tried to figure out which items would be the most motivating to her to actually carry the phone around with her. If we could get her to carry it, and keep it turned on, then the other items would be easier to sell. Steve’s parents are very conscious about safety. It’s not just that they’re of advanced years; they’ve always been this way. I think it’s because Ken worked in the insurance industry and saw what awful things can happen to people. I don’t think I’d be able to step outside if I ever had a job in insurance! Anyway, with safety as a top priority, we gathered together those topics about the iPhone that would help increase her safety. We explained that I she had her phone with her, she could dial emergency services at any time. If she were out alone and she were in trouble, or if she were with Ken and something happened to him, or if she saw someone else in distress, she could immediately get assistance. Find Friends was next on our list. She’s going to be living closer to one of her daughters eventually, and so it would be nice for her daughter to be able to see where she is, again for safety reasons. She could also see where all of us are when we’re on a vacation together. Whenever we go to see her, we use the mapping app Glympse to show her exactly when we’ll be arriving so she knows the value of being able to see someone on a map. Whenever we travel, Ken reminds us to pack flashlights. I showed Merlee how her new phone was also a flashlight and she was delighted. I threw out a few scenarios, like finding a keyhole in the dark, or walking in the evening where tripping had a high probability (at least it does for me!). Both Ken and Merlee are also very much focused on security. Ken is famous for his starring role in the video, Octogenarian Talks about 1Password on YouTube where he explains his belief in the importance of using a password manager. However, he and Merlee don’t have quite enough faith to put their 1Password vault online. I can respect their decision even though I’ve made another choice. That meant though that convincing her to use 1Password on her phone was a non-starter. But I could help her learn to use Touch ID to log into her phone. It’s good to work with other people on something like this because you begin to learn that it doesn’t work well for everyone. I must have the perfect finger dampness level because it’s pretty flawless for me unless I’ve just jumped out of the shower. Kyle’s fingers are a bit too damp, and it turns out Merlee’s are a bit too dry. It took quite a few times to teach the phone her fingerprint. I told her to lick her finger before using it and she looked at me like I had two heads, but sure enough Touch ID worked better for her when she did. I’m not sure she’ll keep using it but she’s got a good passcode so I think she’ll be all right. Merlee likes to take pictures, but only carries a camera on vacations. I showed her how to use the camera on her phone and she loved it. She immediately took a photo of Forbes sound asleep on the floor and was delighted that she could capture that moment. As I mentioned up front, we really wanted to get Merlee into text messaging. We had a phased strategy to get her on board. First I taught her how to use Messages while with her. Then we told her two daughters about the iPhone while we were away that one day, encouraging them to text her. Then after we left on Monday, I wrote to all of her nieces and nephews and encouraged them to start dropping her silly little notes about their lives. While I was teaching Merlee about Messages, I explained to her that she could attach photos. Merlee wrote a message to Lindsay and attached her picture of Forbes asleep on the floor. Imagine her delight when she was able to share that and then get back a super happy message from Lindsay who was missing her baby desperately! Later when we connected her into a message thread with her two daughters, she found out her son-in-law was getting a tattoo, and not only saw pictures of her family but got to see the tattoo! Side note, the tattoo was pretty cool. A couple of years ago this seemingly perfectly healthy man had what they call a “widow maker” heart attack. Because of the quick action of a bystander who saw him on the sidewalk next to his bicycle, he survived the heart attack. The tattoo shows a flatline, above that it says, “not today” and then a heart beat after that. Gives me chills to think about it. Anyway, Merlee knew all of this because of her new iPhone. Merlee wasn’t bad at all at typing on her iPhone, considering it was her first day. I explained that typos are much more forgivable in text messaging because everyone knows how hard it is to type on our little phones. She seemed to accept that so I showed her how she could dictate into the phone and then just fix any typos it made. She was thrilled. She immediately started writing more complex and lengthy messages. Another hurdle overcome. Merlee is a frequent beneficiary of FaceTime from her family (we’re almost all on iOS). She receives them on her iPad and her Mac, so seeing it on her iPhone wasn’t a huge thrill, but the first time it happens when she’s not at home, I think she’ll get how cool this is. I’m not sure when I did it for her, but I had already turned on iCloud Photo Library on her Mac and her iPad. She didn’t do too much on her iPad, but when I showed her that all of her photos were on her phone, she was yet again delighted. 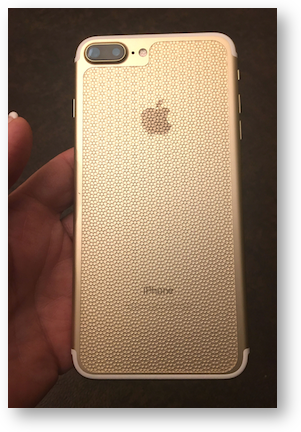 I thought another good strategy would be to help her customize her iPhone to her liking. I first moved all of the applications she would be unlikely to use onto a second screen. Then I took her into the accessibility section of the phone. Merlee is blessed with terrific vision, using glasses only for super close up work. I showed her where she could change the font size and let her drag the slider up and down until she found a spot where it was easily readable to her. Letting her do it herself I think helped her feel she was controlling her own environment. Next we went to ring tones, which I thought she wouldn’t care about. I was wrong! she has a friend who has a super-annoying ring tone, you know, one of those ones that goes on and on and on? Because of that she wanted something simple and not annoying to others. I think she enjoyed picking it out herself. Next I explained that she could modify her desktop wallpaper and the lock screen on her phone. I figured she’d say she didn’t care about that, but again I was wrong. She had just received a photo of a painting of her father’s cabin on Spirit Lake in Idaho. Even though it was a landscape image, we were able to slide it around and make it fit perfectly. When she saw her phone’s lock screen showing that precious memory to her, she held the phone to her chest. It got to her heart. I think that’s the real magic pixie dust that Apple put into the phones. They get to us at a visceral level that’s hard to explain. We thought that she would want us to put her music on her phone but yet again we were wrong. She said that she has it on her iPod and she walks with her iPod in her pocket, so why would she need it on her phone? We tried to explain that having her phone with her was a safety feature and easy enough to carry but she really didn’t want to take that step just yet. We have a feeling once she’s used to keeping the phone with her, she’ll want her music but there’s no need to push her for now. What better way to customize an iPhone than to get your own case? Way back in the iPad Pro keyboard débâcle, remember I actually made money on the deal? Apple gave me a store gift card that was more than what I paid for the iPad Pro originally, so I had just enough money left on it to buy Merlee a case. We went to the Apple Store, and she picked out one just perfect for her, and again, she was delighted. Remember our strategy to come back two days later to see how she was doing? Well get this. She showed me a really adorable thank you note that she’d gotten from her great granddaughter Selah and great grandson Jack. On the note, Selah had written 100% and a smily face next to it, and then 60% an a frown face. Merlee was confused about what it could mean. I hope this little story will help you if you ever find yourself trying to convince someone to get a smart phone. Remember to make a strategy that includes getting them comfortable at their pace, and figuring out what’s important to them first, not what you think is cool about a device. And most of all be prepared to be wrong about what they will care about!